Recent Pacquiao versus Mayweather Jr. fight news indicated 38-year-old American boxer formally rejecting the $5 million penalty clause should he and the Filipino contender fail a drug test before or after their most awaited May 2 bout. Advisor to the fighting congress member, Michael Koncz told USA TODAY Sports this week that he was a bit "puzzled" and a "little dismayed" that even an agreement this "simple" can't push through. "It was very simple," Koncz said. "If Manny failed a test, he would have to pay $5 million. 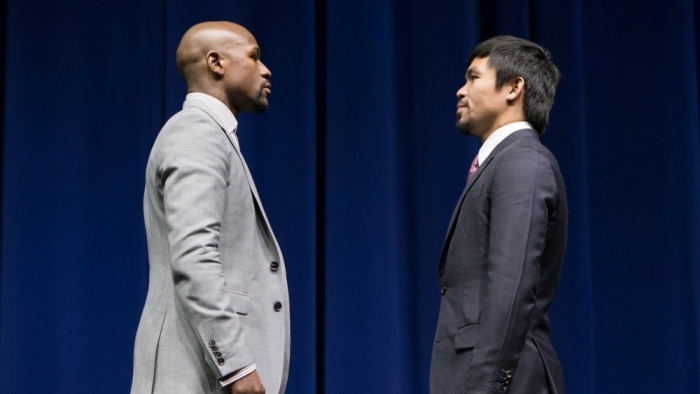 If Floyd failed, he would have to pay $5 million." A report from LA Times meanwhile cited Mayweather's camp firing back with the controversy saying that the drug testing condition have been "rigorously negotiated" by Pacquiao's promoter, Top Rank, suggesting that they are already in the disadvantage. In a statement given to ESPN, Mayweather's chief executive Leonard Ellerbe called Koncz a "moron." "If this moron didn't convey his fighter's wishes when the negotiation was going on that's their problem," Ellerbe told The LA Times. "This is a lame-a-- attempt to generate publicity." It was revealed that earlier this week, Pacquiao's legal assistant, David Moroso, received a letter from Mayweather's legal counsellor Jeremiah Reynolds indicating that the currently undefeated boxer would not enter into the mentioned penalty deal. Top Rank's Bob Arum meanwhile chimed in his opinion about the disagreement saying that he fully understood Mayweather's people not accepting the deal for the reason that if either side fail, "the other camp would be able to sue for far more than $5 million." The previous reports from the US Anti-Doping Agency announced that both fighters have agreed to submit themselves for an unannounced blood and urine testing at anytime during their training sessions in their respective camps. The search would test each athlete for performance-enhancing substances like Human Growth Hormone (HGH) and EPO.